These are the coins we used for change 1964 and previous. This category has very little numismatic premium. Their value is the 90% silver content. A slang term for these coins is “junk silver”, but dealers usually refer to them simply as, “90%”. These are often traded among dealers by the “bags”, which refers to a $1000 face value in a bag which weighs approximately 55 regular pounds, and 720 troy ounces of pure silver. Dealers usually deduct a few ounces for wear on the coins, using 715 troy ounces when figuring the troy weight of a “bag of silver”. If silver is $30.00 an ounce, then multiply $30 X 715 to determine the metal (intrinsic) value of the silver in a bag of coins. During inflationary periods there is usually a great demand for silver coins; then bags are bought and sold at a premium over the actual value of the silver. When the demand diminishes, bags trade at or below the silver price and are often sent to the refinery and melted. Silver coin is an excellent way to buy silver. 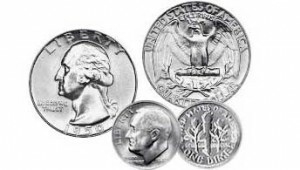 American 90% silver coins are widely recognized, extremely liquid, and can be broken down into small denominations, as small as a single silver dime. Dealers will always pay higher for bags or half bags, opposed to just a few silver coins at a time. The only drawback to the silver coins is that they are quite bulky. 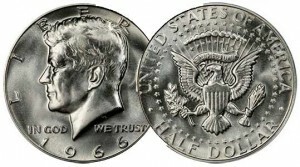 These are 40% silver content half dollars dated 1965-70. After silver coins were eliminated in 1965, Congress decided, for some obscure reason, to continue a small amount of silver in the half dollar. These contain outer layers of 80% silver, bonded (clad) over a core of pure copper. The ASW (Actual Silver Weight) is .148 troy ounces in each coin. Most all these get melted. The big drawback is even greater bulk than in 90% silver coins. Dealers always buy these below melt. This is not the way to go. These are very popular coins. They contain .77 oz. ASW and when silver is low there is always a large premium over the metal content. When silver is high (Like $30 in 2011), the premium shrinks. 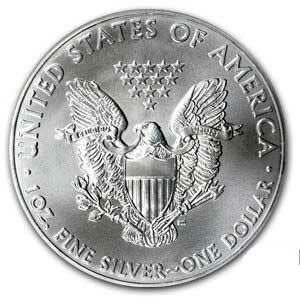 When silver goes to $50 an ounce common circulated silver dollars will be just be silver just like common 90% coins. High grade uncirculated dollars MS65 and higher and rare dates tend to go up much faster than the silver price and are recommended but not the common circulated ones unless near the ASW. These are legal tender $1 coins, were first sold by the US Mint in 1986 at $1.30 over silver. Since then they have raised the premium to several dollars over spot. Coin shops usually add a dollar or so to that and it makes for a relatively high premium considering that you can buy one ounce rounds and rectangles for only about a dollar or so over spot. Our opinion: It’s nice to own American silver like the one ounce Eagle coins but if silver rises to $50 or more, dealers will likely not pay more for silver Eagles than generic rounds or ingots, so why pay a big premium now? 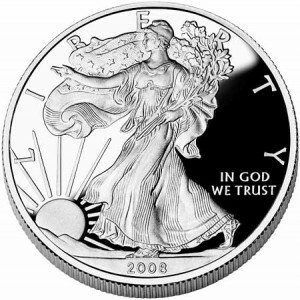 However, the eagle is the most popular one ounce coin, and most Americans are willing to pay extra. Neither the public, nor local dealers can buy these directly from the mint. These might be OK for Canadians, but the American dealers look at them as undesirable 80% scrap silver. A dollar’s worth of Canadian silver coins, including the silver dollars is .6 oz. ASW. 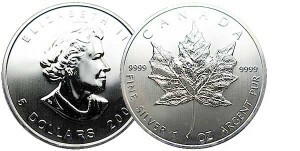 The Canadian government also sells a one ounce bullion coin, the Silver Maple Leaf, with a $5 face value. This is recommended only if you can avoid the higher premiums charged by the Canada Mint. This includes the government issued “Onzas”, 100 Pesos, and Libertads. 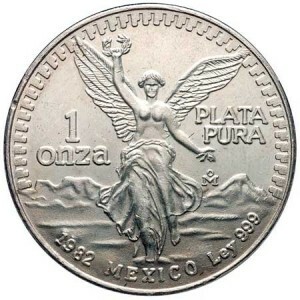 The one ounce Libertad is one troy ounce of pure silver, and is usually sold around the price of common generic rounds. Other silver Mexican coins with no collector value are scrapped out by US dealers. Buy only the one ounce Libertads if at the same price as silver rounds and rectangles.